One of my long term goals in wargaming has been to do up some winter terrain, I had planned to do so with my Skraeling for SAGA but decided against it as their Viking enemies would have only be useful for fighting in Vinland. Chain of Command however has opened up an opportunity to do this. As a terrain modeler, I have always been attracted to wilderness terrain, like the barrenness of the deserts of north Africa or winterscape of Scandanavia.Once I read about the Winter War, I knew I found an interesting era to game for skirmish battles in WWII. Winter figures in 20 mm are a bit limited; in fact limited to Fantassin/Warmodelling as far as I could sort out. I had already heard that these figures were a bit smaller then the PSC, AB and TQD Castings that I already have in my WWII armies. The figures though once obtained were about the same height as what I have and really they have quite a complete range. The Warmodelling range had pretty well everything I needed to build a force with a good range of supports. They are available from Scale Creep Miniatures in the US and from Warmodelling in Europe. So on to the figures, well they are pretty good sculpts but horrible casts. I really like all the poses and the bodies are well proportioned. The rifles may be a little big but are well detailed and fun to paint. The face are a little rough, do Finns really have very sharp noses! The boot were a little understated as well, but otherwise they were fine. The casting though is awfully especially with bits on the faces which is almost impossible to remove, I find it always difficult in the first run through with new figures to remove flash, as I am never sure where it is until I start to paint details. I have a second shipment coming to complete the force so I think it will go a little better the second time. I enjoyed painting them, I found an excellent you tube video from BF which was quite helpful. Essentially two grays and a highlight of white. Webbing and straps were Vallejo Violet Green, I like the variety of hats, maybe I should of done the fur hats with a black wash rather then a brown, but I did want some variance from the gray spectrum of colour. Blue cap badges for the troops and red for the leaders. In the first photo after the group shot we see a 3 man LMG team as well as the two senior leaders. In CoC the Finns have two different types of rifle section, with two of each to make up a platoon. The LMG section has 10 men and the SMG section has 6 men. You can substitute in a soldier with a Molotov as a level 1 support. We also have some figures throwing grenades. I did enjoy doing the bases and am looking forward to doing up some terrain. I have purposely avoided close ups, these figures are just a little too roughly cast for this. I get a sense at 20 mm it makes the figures look much worse then they actually do on the table and just distracts from the submission. I hope I am forgiven for making this point. Overall I am really pleased how these figures look on the table, I just now have to decide what figures I will use for the Russians and eventually some Germans. 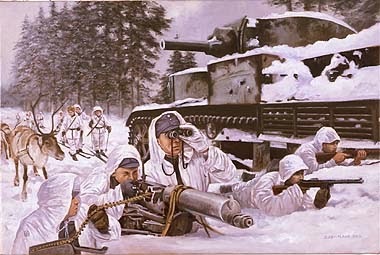 I have wanted to do winter in wargaming for a long time. More to come, I have two more sections on the paint table as well as a Vickers MkVI, and multiple heavy weapons support teams. Greate start to a Greate project! Looking forward to see more. Seriously,the ability to to digital pictures of our work and share them easily on blogs etc has certainly raised the bar for our collective painting, which is for the best in general. At the same time, for the most part these are *wargames* figures, and once you get to table distance (several feet away), the difference between an acceptable paint job and a superb one is largely moot. Nice figures. Thanks for sharing the tutorial! Seems we share a passion for Winter War. I have been doing it in 20mm for IABSM and jumped on the Baker Company kickstarter to do it in 28mm with CoC. You say that you have only found Warmodelling figures for Winter War. There, I have some good news. Nice work and great project! As a matter of fact, that thread is pretty helpful for all things Winter War Soviet. Best of luck on your project!